Thailand's army chief declared himself acting prime minister late Thursday, as the country's military announced it had taken control of the turbulent Southeast Asian nation in a bloodless coup. 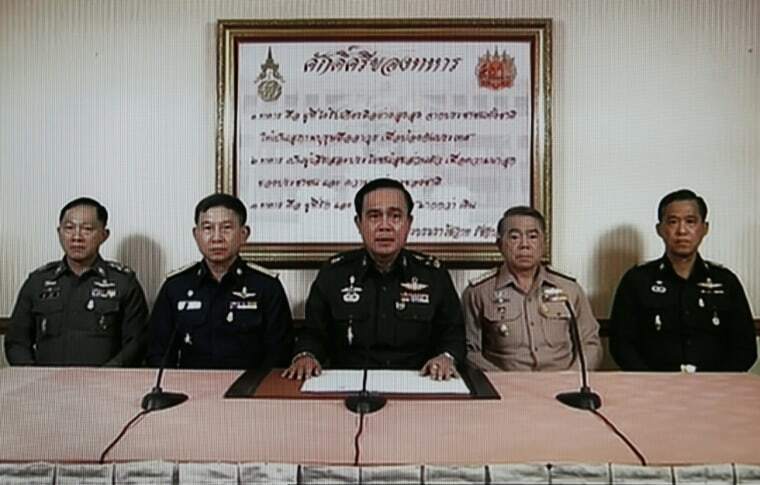 Gen. Prayuth Chan-ocha will act as prime minister until the new coup regime can find someone else to assume the post full-time, the military announced Thursday night, according to the Bangkok Post. The military takeover came Thursday, two days after the army declared martial law to restore order to a country that has been plagued by violence that has killed 28 people and injured hundreds of others since November. The takeover marked Thailand's second coup in eight years. Meanwhile, the ruling military summoned members of the politically influential Shinawatra family to a meeting Friday morning, according to The Associated Press. For seven months, anti-government protesters have lobbied for the ouster of the Shinawatra family — and its alleged corrupting influence — from Thai politics, the AP reported. Former Prime Minister Yingluck Shinawatra was sacked by the Constitutional Court earlier this month for nepotism. Her brother, billionaire Thaksin Shinawatra, was deposed as prime minister in the 2006 coup and lives in exile.